A new psychology class allows students to tutor kids from underserved communities while studying child cognition. Twice a week, a huddle of students gathers in Muir Parking Lot P208 to carpool to a location half an hour away. They aren’t playing hooky — they’re taking PSYC 117, an upper-division Psychology Project Lab class in which students apply classroom concepts to improve a tutoring program for grades K–6. Launched last year and taught by cognitive psychologist Dr. Daniel Bajic, the course has garnered overwhelmingly positive reviews and is expanding its scope for its spring offering. It is part of an ongoing initiative by researchers at the UCSD department of psychology to provide and improve educational enrichment opportunities to children of underserved communities. The children who participate in the Spring Valley Community Center’s after-school program typically come from diverse backgrounds with family household incomes in the lower bracket. Several of the schools in East County have historically failed to meet minimum achievement levels required under the 2001 No Child Left Behind Act. 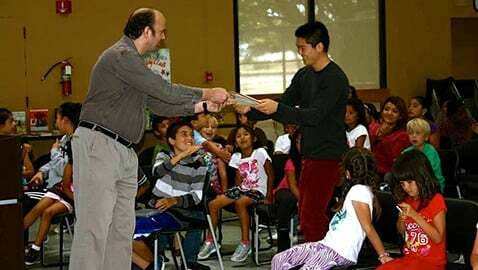 The UCSD students assist these children with homework and guide them through structured activities in math, language arts, science and engineering. Their assignments serve to develop and challenge the children’s abilities, enabling student researchers to measure their progress. At the end of each meeting, the children practice their public speaking skills while the students provide encouraging claps and cheers in the audience. Students in PSYC 117 examine such topics as cognitive skill acquisition, child psychology and educational policy at the state and national levels. Bajic believes that the main focus of his research — how people acquire new intellectual skills and retain information — can help educators develop optimal pedagogical approaches. Prior to the project, he had no experience with youth education, but getting involved has proven to be a more rewarding experience than he could’ve imagined. Bajic himself did not come from a conventional educational background, dropping out of school after the fifth grade and returning only for college. According to Bajic, his parents — observing how much he resented going to school at the time — recommended that he discontinue his studies, as they didn’t want a hatred of school to turn into a hatred of education. He was subsequently put in charge of his own schooling — he could study whatever he wanted, whenever he wanted, or not study at all. Bajic similarly does not want the kids at the Center to feel as if they are being dragged through the formal educational system against their wills. Bajic hopes that his PSYC 117 students will gain an informed perspective that will help them as future parents, prospective teachers and voters on matters related to education policy. To gain this perspective, he believes students need to learn how to have a meaningful dialogue with the kids. One of the program’s larger visions is to serve as a flagship model for similar projects that could be implemented in other universities. Bajic is optimistic that the work resulting from this project will potentially benefit kids who aren’t even enrolled in the programs — perhaps even kids who aren’t in the U.S.